Concrete Coatings Design Lab - Concrete Coatings, Inc. 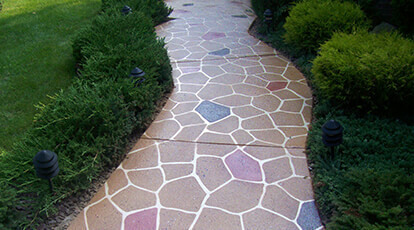 CONCRETE COATINGS, INC IS MIXING UP FRESH DESIGN IDEAS FOR YOUR NEXT PROJECT. Perfect for heavy duty industrial flooring. Tough and resilient it’s the go-to choice for high traffic areas. In and out of the kitchen, restaurants are elevating their look with acid stained flooring. Easy to clean up and easy on the eyes—it’s a sure-fire choice. Concrete flooring doesn’t have to feel insitutional. Add a little something special to the look with some of our more subtle acids stains. A little classic, a little modern, the Spray-Tek look is fun flexible and uniquely yours. Concrete doesn’t have to look gray and cold. Our GraniteLook™ pairs beautifully with warm woods and classic finishes. With an array of colors and looks you can customize, you will be sure to find style while enjoying the advantages of a permeable surface. This custom coffee table is a stunning way to brighten up a room. Sure to be a conversation piece and the next family heirloom. Our VIVID™ Acid Stain with a UV Shield™ topcoat is easy to clean and stays looking shiny and new.